One Pot Easy Prawn Pulav Recipe made with Indian whole spices, Coconut Milk and coriander and mint leaves. This post has both Instant Pot and traditional Stove Top methods. This Spicy, earthy rice dish is perfect for days when you want to impress guests with your culinary skills but don’t want to put in too much effort. Or when you just want to eat something hearty and delicious! To say this was life changing is short selling this recipe. It’s the best prawn recipe to have happened to me in a long time!! My usual go to prawn recipes are Authentic Mangalorean Prawn Sukka and Kerala Prawn Curry Malabar Chemmeen Curry .but I am so so happy with how this turned out that it’s become a weekly staple at home! You can see how I made the prawn pulav in the instant pot in my stories on Instagram. Both Instant Pot method and the stove top method of making this pulav take similar amount of time. This is an important step because this step creates the flavour of the pulav. Make sure you sauté the onions and tomatoes well.It takes longer to sauté stuff in the instant pot than Stove Top. So you could just break the process into two steps 1. sautéing on stove top 2. Cooking in instant pot. This pulav is simple because it’s a one pot recipe. You can do everything in one pot and unlike a biryani or a fancy pulav, it doesn’t need additional frying and layering steps. After you make the base sauce or masala for the pulav, all you have to do is add rice and cook it. Frankly, I like it just the way it is but if you are throwing a feast or a proper dinner then I suggest you pair it with a quick Raita made with cucumber or onions. Heat the Coconut Oil in a heavy bottomed pan.Add the Shallots, onion and green chillies. Sauté till golden brown. To this, add the ginger, garlic and tomatoes.Cook till the tomatoes become mushy and disintegrate. Tip in the prawn along with coriander powder, chilli powder and turmeric. Sauté lightly for about 2-3 minutes. Once the prawn looks slightly transparent, add the rice, coriander and mint leaves, cardamom, cloves, bayleaf, lime juice along with the coconut milk.Add 1.5 Cups of water. Season with Salt and bring to boil. Cover with the lid and let it cook on low flame for 20 minutes. Switch on the SAUTE mode.Once hot, add coconut oil.Add the Shallots, onion and green chillies. Sauté till golden brown. Cancel the Sauté function.Choose “Pressure Cook” function and set the timer for 12 minutes with the valve at “Sealing” position. If you Love the Recipe, Please leave me a comment ! I would love to here from you! 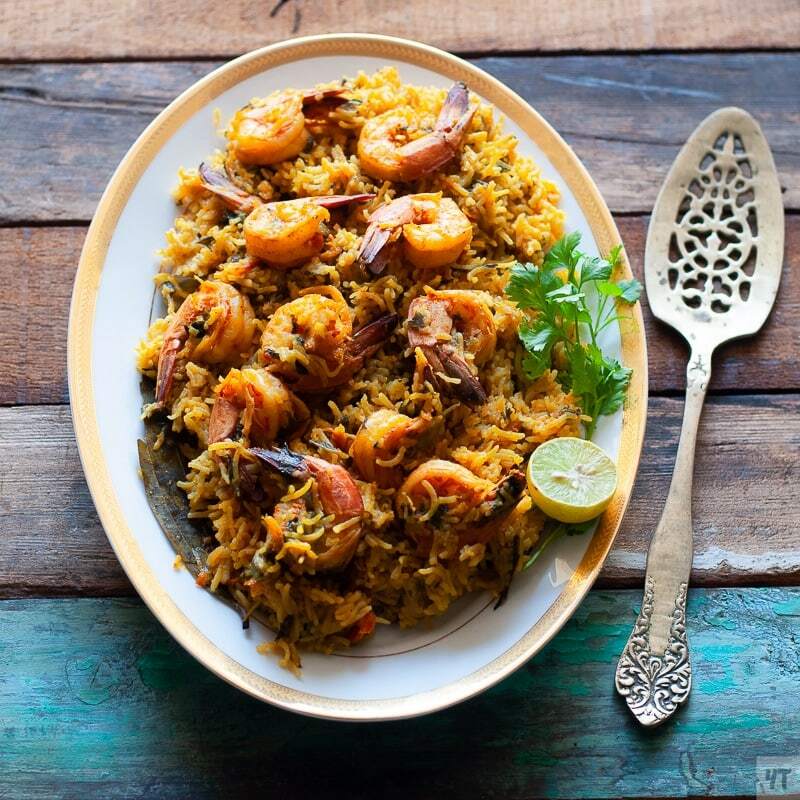 Pin this Super Easy Prawn Pulav recipe for Future reference! Here are some more awesome Seafood recipes for you! Easy to make Kerala Prawn curry with Coconut Milk and Kokum.